Vanillaware‘s recently-announced Odin Sphere: Leifthrasir was playable at the Tokyo Game Show this year, and let players take any of its five protagonists into a brief dungeon. The demo consisted of a room from each of the eight worlds, including a miniboss, a shop room, and a final dragon boss, and did a good job of both showing newcomers what Odin Sphere is like, and veterans what has changed. I played the PS4 version, though it’ll appear on PS3 and Vita as well. There are, of course, a lot of additions from the PS2 version: more backgrounds, more areas, more enemies, more music and more skills. The biggest changes seem to be in the level-up and skill systems: the HP and Weapon levels are gone in favor of a single experience bar, which fills when you eat fruit or defeat enemies. Phozons are now stored up not just for special attacks, but also to purchase some sort of character upgrades, which weren’t accessible in the demo. 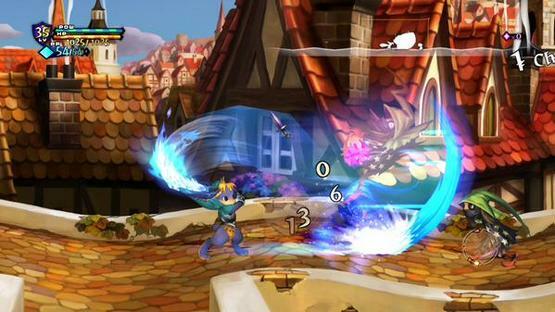 Each character has new MP-consuming combat abilities which can be mapped to button combinations: for example, Velvet has fire magic that runs along the ground, and Cornelius has a drill-like dive attack. The maps in Odin Sphere: Leifthrasir have a similar structure to those in Vanillaware’s Muramasa: The Demon Blade. Some rooms are still circular, but others are “flat,” with exits at fixed points on the map. This allows for a wider variation of rooms, and some verticality added to a game that lacked it except for in the final boss battles. Traversing vertically is a breeze, and attacking up or down levels feels as natural as if it had been a fixture of the original game. Slowdown that plagued the original is gone, but there is a deliberate, split-second pause that occurs when delivering a killing blow to an enemy that can get distracting, and if you take out a group of enemies at once, you could be fooled into thinking the game was lagging. The demo didn’t have rooms with large numbers of enemies on the screen, so it can’t be said that the game looks lag-free, but it’s certainly better than the original version, which had lag that was absolutely appalling. Odin Sphere: Leifthrasir will be released in Japan on January 14, 2016. Its North American release is reportedly coming sometime later within 2016.